JRPG fans will have a blast this week. Just yesterday Square Enix published the much awaited Final Fantasy IX for Android and almost immediately after that, DotEmu has released “Ys Chronicles II: Ancient Ys Vanished – The Final Chapter” to the Play Store, sequel to the original Ys game. This sequel has revamped graphics for a more modern presentation, but kept the real-time combat system of the original game. 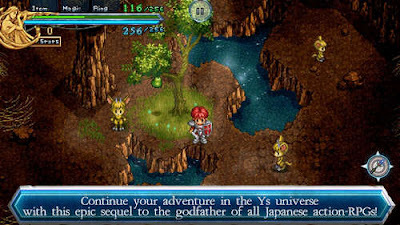 Players control the hero Adol in a top-down interface common to JRPGs. The battle system is a little bit more unique, as it requires players to attack at an angle not common to RPGs. Ys Chronicles II full version APK free download is available for our beloved Android users. A mod with unlimited money and xp is also included. Sd data files will be added after we upload them! Install the APK, Extract Data and move ‘com.dotemu.ys2x’ folder into /Android/obb/ and play the game. DATA Link is down, can you fix it please?